It’s easy to be familiar with the basic components, when putting together a plan like; Sets, reps, rest periods, exercise choices, how many times to train, etc. But here we are going to look at why TUT is extremely beneficial to you and your plan! I like to use tempo in my training because of the way it targets muscle fibres. The sets that I use are when half of the set is performed explosively, and the second half slow. The initial portion of the lift forces a strength adaptation because the movement is explosive and requires a coordinated effort with all of the motor units within a particular muscle. This fatigues the muscle, and then the slower reps benefit. The slower reps target and fatigue the muscles and trigger a mass or hypertrophy response. Here’s the basic idea of TUT. The first number (3) is the eccentric, or lowering, component of the lift. The second number (0) denotes any pause at the midpoint. The third number (1) is the concentric, or lifting, component. Finally, the fourth number (0) denotes any pause at the top. A 3010 tempo makes perfect sense on lifts that start with an eccentric, or lowering phase, like a squat or bench press. You lower the bar for 3 seconds, there’s no pause at the midpoint, then return to the starting position. Reset and go again. However, if you start with the concentric portion of the lift such as chin-ups and barbell curls, the first number is always the eccentric, and the third number is the concentric. Who should use tempo training? 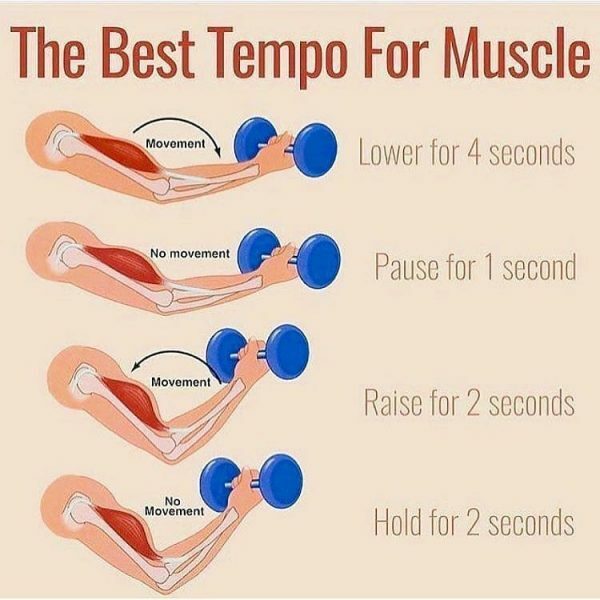 Everyone should use tempo training at some point during their workouts. Athletes can benefit from slower TUT’s that focus on the eccentric in the off-season as this will develop body control, connective tissue strength and hypertrophy. However, as you get closer to your goal, you’ll need to become more “sport” specific with your TUT training. If you’re a power or Olympic lifter, there’s no reason to knowingly slow down your squats. Why should you use tempo training? Development of connective tissue strength. Focus on muscular elements versus tendinous elements (a slow, controlled motion is going to place more stress on the muscles, whereas a bouncy or ballistic motion will place more stress on the tendons, etc.). How should you use tempo training? In a base or accumulation phase, try throwing in some continuous motion exercises such as bench presses/push-ups, squats, chin-ups, etc. This can be done with just about any exercise, but the key is not to let your ego get in the way. Exercise: Squats, Bench Presses, Chins, Rows, etc. The key here is to not stop or rest at any point during the set. Focus on maintaining continuous motion. While it’s not specifically noted in the other tempos, a zero (0) as the fourth number typically means you can reset in between reps. In the case of 2-0-2-0 tempos, you can’t rest between reps as doing so decreases the training effect. Furthermore, it’s highly recommended using a timer on your smart phone to make sure you’re not cheating. For example, go through your typical squat workout. Then for a set or two, cut the weight by 50% and lower to the bottom position and hold for a 3-count. Stay tight, and then drive up hard to the starting position. If you consistently take away that stretch reflex and force your body to stay tight, you’ll build some amazing starting strength. As a side benefit, you’ll become more aware of where your body is in space, and find the most optimal line for each specific lift. 3-0-1-0 and 2-0-1-0 are the most common tempos you’ll see in my programming. Teaches people to lower under control. Allows them to “feel” where their body is in space. Develops muscular and connective tissue strength early on in a programme. As someone progresses, 2010 is the most common tempo you’ll see. 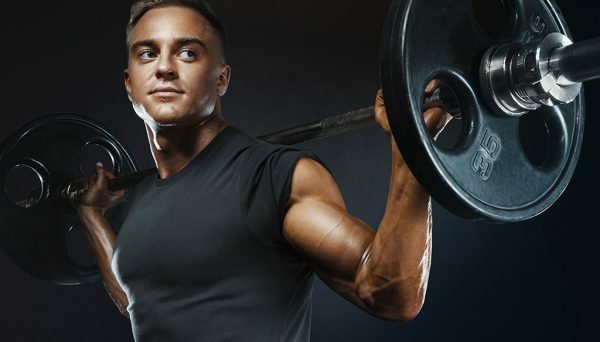 Essentially I want them to control the eccentric portion of the lift and raise the bar as quickly as possible (the number of which can also be replaced by an “X,” which means do the rep explosively). ISO. Isometric contraction (typically at the midpoint). An example would be performing an ISO hold at the top of a chin-up, the bottom of a lunge, or the bottom of a push-up, etc. This is really good for those who lack stability or are dealing with injuries. Dyn. Dynamic. This would typically be used when you aren’t too focused on the tempo of the lift, or it’s somewhat hard to control. I’ll often use this with step-ups, concentric-only movements like sled drags, and various other movements. Exp. Explosive or powerful. Typically used with Olympic lifts, med ball exercises, jumps, etc. 4-Count. Just like the name implies, I’ll use this for exercises where I want four fluid “steps” to the movement. Examples would include prone rows to external rotations, chop/lift variations, etc. 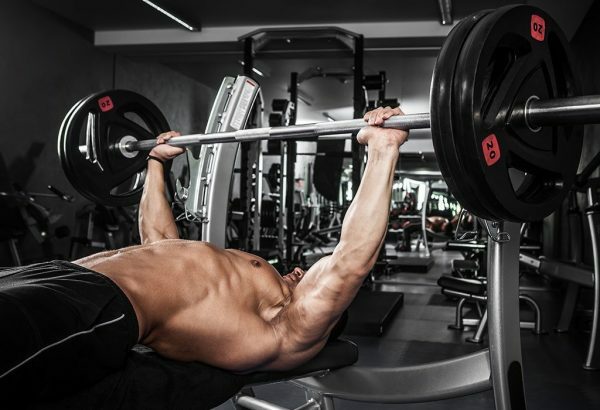 The post Tempo Training Method: Time Under Tension – Improve Your Strength Gains appeared first on GymGuider.com.